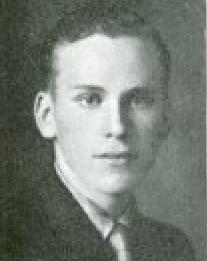 His basic flight training successfully completed, Aviation Cadet Frank T. Hinshaw, son of Mr. and Mrs. Clyde Hinshaw of 116 N. Glenwood, will enter the third and last lap of his aviation cadetship when he reports for advanced flying instruction at Brooks Field, San antonio, Tex. At Brooks Field Cadet Hinshaw has been ordered to heavier more powerful machines for a final 10 weeks' intensive training, upon the completion of which he will receve his wings and lieutenant's bars as a flying officer in the United States Air Corps Reserve. Cadet Hinshaw, who entered basic traing at Goodfellow Field, San Antonio, on July 15, took his primary training at Hicks Field, Ft. Worth, Tex. Before entering training, he attended the University of Missouri, where he was a member of ETA Kappa Nu fraternity, national electrical engineering honorary fraternity, and Tau Beta Pi, national engineering honorary fraternity. 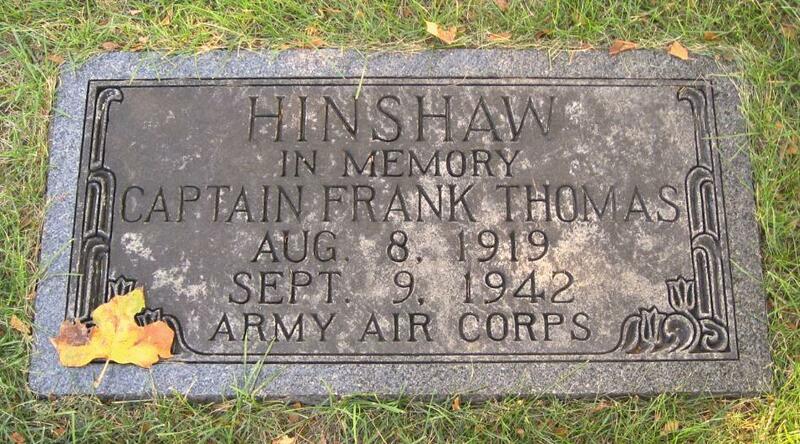 Frank Thomas Hinshaw died Sep 9 1942.1,7,8,9 Frank died as a pilot during World War II.10 He was officially listed as missing in action.7,8,9 A memorial to Frank is in Battery Park, New York City.7,8,9 A memorial stone is also in Memorial Park Cemetery in Columbia, Missouri,11 where Frank's parents and family are buried. A family paper in the handwriting of Clyde Herbert Hinshaw. 1920 census, Cedar Township, Boone County, Missouri; roll T625-906, ED 6, page 1B, line #71, dwelling #20, family #20. 1930 census, Cedar Township, Boone County, Missouri; roll T626-1176, ED 7, page 6A, line #45, dwelling #143, family #143. 1940 census, Columbia, Columbia Township, Boone County, Missouri; roll T627-2086, ED 10-20A, page 3B, line #61, household #62. The "Columbia Daily Tribune", Columbia, Missouri, Saturday, Sep 26 1941. American Battle Monuments Commission: http://www.abmc.gov/search/wwii.php. World War II and Korean Conflict Veterans Interred Overseas; http://www.ancestry.com.